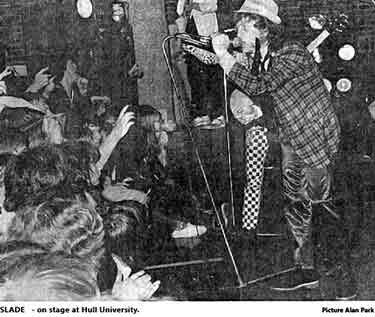 THE BIGGEST and loudest sound system I have ever seen at Hull University could not hide the fact that Slade were yesterday's heroes last night . Vocalist Noddy Holder led the way through the old classics such as 'Take Me Bak 'Ome' and 'Everyday', but the band rapidly faded into heavy metal cliches. New material was shrouded in dry ice, but even the choking clouds could not hide the limits of Slade's half hearted attempt at ska-disco music. Their only claims to fame came at the close of the set with speeded up versions of 'Gudbuy T' Jane' and their first hit 'Get Down and Get With It', but the nostalgia backfired. The Top 10 hits of the early 1970's were reduced to fast throwaway versions and the band fast became caricatures of their former selves. The crowd, thrusting fists forward and jiving to every number, did not seem to worry on the night of the student's union ball, but as an old Slade fan who loved their early arrogance and heavy originality, the performance was a big disappointment for me. An encore of the sublime 'Mama Weer All Crazee Now' did not help and only a smoke ridden finale of 'Born To Be Wild' satisfied my nostalgic urge. bands cannot live on past glories alone and although Slade may have more to their credit than most, it must be time that they began to lie down and accept them.